Sarah Dessen knows her literary lane and wisely sticks to it. She writes coming-of-age romance novels grounded in reality, a welcome relief for readers tired of, or never interested in, the fantasies, scifis, thrillers, apocalyptic/post-apocalyptic, alternative histories (heaven help us), dystopian, cyberpunk, paranormal romances, and speculative fiction currently populating YA bookshelves, real and virtual. Louna Barrett, like other Dessen protagonists, is wise beyond her 17 years. She’s jaded enough to be interesting and not so jaded as to become annoying. She is talented, hard working, appropriately philosophical, and emotionally bruised. In short an excellent role model for teens. 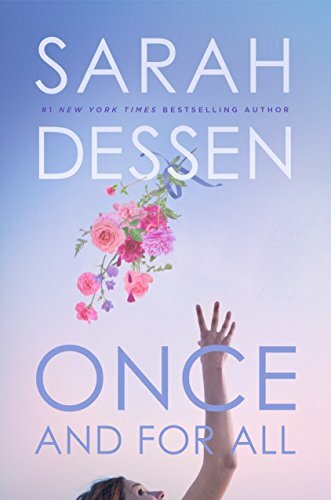 In Once and for All, Dessen takes on the emotionally fraught world of wedding planning. Natalie Barrett, our protagonist’s mother, and Natalie’s gay business partner William¾both driven perfectionists and both soured on the subject of love¾plan weddings. A Natalie Barrett Wedding is THE wedding to have in this fictional world. Louna, now in her summer before college, has been helping out in her mother’s business for years. She’s equally skeptical about true love and, especially, happily-ever-afters. After all, she’s seen her share of perfect weddings result in less-than-perfect marriages. Her own parents’ marriage ended in divorce, and her mom hasn’t dated since. And Louna has other, more personal reasons for her lack of faith in lasting love. Her true love [Spoiler Alert] was recently killed in a school shooting. Dessen excels at snappy, witty dialogue and keeps the tone of the novel light, offering hope and promise, not gloom and doom. Her readers, after all, like her characters, are generally in their teens. When tragedy or even disappointment strikes at this age, while it might seem as if life is over, the truth is that life is just beginning. That said, Louna’s grief reads as very real. Not only has she lost what she perceives to be her first (and perhaps life-long) true love, she lost him in an unimaginably painful way. She’s a sensitive girl. She’s not going to bounce back quickly, despite the efforts of her ebullient bestie, Jilly, who is constantly prodding her to get out and date. Enter Ambrose, prospective love interest for Louna and the boy who will help her overcome her grief and move on emotionally. Louna’s mother has hired the lovable, quirky, annoying, flirtatious, deeply flawed Ambrose to assist her for the summer at Natalie Barrett Weddings. Louna is appalled. And, as she proclaims numerous times, not romantically interested. Yeah, right. We see Louna’s resistance to Ambrose’s charms wearing down as the summer progresses­­. Who wouldn’t fall a little bit in love with a boy who dognaps an abused pet? But Dessen knows better than to serve true love with the first course. Ambrose, a serial dater, challenges Louna in a bet. He must attach himself to one girl for the summer; she must get out and start dating. Louna is competitive and so sure she’ll win, she takes the bet. Obstacles arise, misunderstandings occur, missteps are taken: Will the two kids ever get together? Dessen is a master of inflection and subtle verbal hints. In Once and for All, readers get a well-written story embedded with lessons on expectations, relationships, communication, friendship, and love. (As well as what not to do at their weddings.) As always there are echoes from Dessen’s previous books, which will delight her fans.